Recently I had the pleasure of doing an interview for the International Journalists’ Network. This video is on breathing and even though it was done to help journalists all over the world, it can help you with your voice as well. In this video I explain the basic principles of breathing and demonstrate three simple exercises. 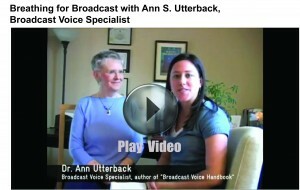 For more breathing exercises, ck out my ebook the fifth edition of BROADCAST VOICE HANDBOOK. You can download it instantly by clicking here! Thanks for the helpful tips! I never knew caffeine could be bad for the voice… I’m going to make sure I buy decaffeinated tea from now on! Caffeine can certainly make it hard to focus your thinking when you’re doing your podcast, and that’s not a time when you want to struggle for words. You want your thinking to be clear and your words concise. Stick with water before you get on the mic, and you’ll find your mind is clearer and more focused. I’m glad you found it helpful, Andrew. More breathing tips to come so stay tuned! It’ very interesting. I’m an Italian singer and vocal coach, and I find Ann’s work great! Are You Gasping for Air In Your Podcasts?